Can’t figure out how to access auto summarize in Microsoft Word 2007? That’s because it wasn’t included on the ribbon. But don’t get discouraged…this tutorial shows you how to access and use the tool, and tips for best results. Unfortunately, this only works in Word 2007; the tool has been completely removed in Word 2010. If you use auto summarize on a regular basis, you will lose the tool if you upgrade unless you install Word 2010 alongside your old version. See my Microsoft 2010 installation instructions to learn how to run two versions of Office on the same computer. The AutoSummary tool scans the Word document, determines the key points, then automatically creates an executive summary or abstract for you. Under most circumstances, it is best to write your own executive summary or abstract, but in a pinch, having a way to do it automatically comes in handy. But always remember to review the summary for accuracy and completeness especially if you are writing a paper for school. Open an existing Word 2007 document or a new Word file. Click the Customize Quick Access Toolbar button. On the left menu, select Customize. 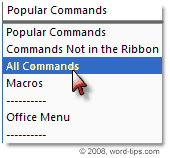 From the Choose Commands From drop down menu, select All Commands. In the alphabetical list, highlight Auto Summary Tools, then click Add. To automatically add an executive summary or abstract to your report, just click the AutoSummary Tools icon on the Quick Access toolbar, then select whichever tool you need. The AutoSummary tool may have difficulty recognizing the key points in a poorly organized document. For best results, always write your document from a well-constructed outline. Using the built-in styles for headings and subheadings also helps Microsoft Word create a more accurate summary. 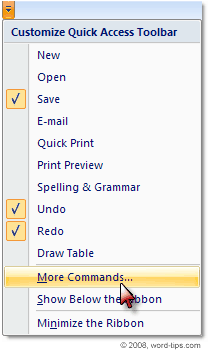 Microsoft Word 2007 …it’s a whole new Word!